The Cavaliers’ LeBron James, left, drives against Toronto’s OG Anunoby during Tuesday night’s game in Cleveland. 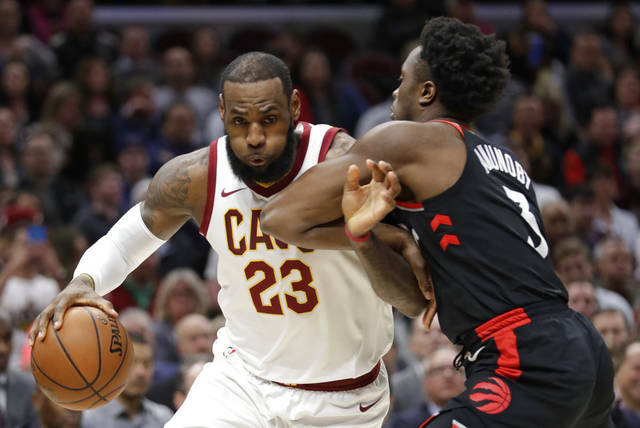 CLEVELAND — LeBron James scored 27 points, the last coming on a sensational layup, and the Cleveland Cavaliers gave the Toronto Raptors another reminder of what could lie ahead in the playoffs with a 112-106 victory on Tuesday night. James added nine rebounds, six assists and helped put the Raptors away down the stretch with an artistic three-point play. It was Cleveland’s second win in two weeks over the Eastern Conference’s top team, whose lead over second-place Boston continues to shrink. This time, the Cavaliers were much healthier than when they beat the Raptors on March 21 despite missing five rotational players and coach Tyronn Lue. Jose Calderon added 19 points and Kevin Love had 18 points and 15 rebounds for the Cavs, who are 9-1 since March 17. DeMar DeRozan scored 19 and Jonas Valanciunas 17 for Toronto, which will host Boston on Wednesday. The Raptors didn’t quit and scored eight points in 34 seconds before the Cavs put it away with four free throws. Kyle Lowry scored only five on 2-of-11 shooting. Toronto was still within 11 in the fourth when James drove the baseline, hung in the air and spun in a reverse layup while being fouled. He pounded his chest and screamed as he walked near Toronto’s bench and coach Dwane Casey, who has seen the three-time champion make that kind of play so many times before. The Cavaliers still aren’t at full strength. Starting point guard George Hill missed his second straight game with a sprained left ankle and Lue was in attendance but only in an advisory role as he remains on medical leave. The Raptors are in the midst of a grueling three-game stretch against Boston, Cleveland and the Celtics again that Casey believes will toughen his team. They still need to be better against the Cavs, who have eliminated them from the past two playoffs. Cleveland’s ball movement was excellent in the second quarter and so was its accuracy. The Cavs made their first five 3-pointers — in less than four minutes — and opened a 16-point lead. Love dropped three of the 3s with the others by Rodney Hood and Calderon, who made his first six field-goal attempts and scored 14 in the opening half.